Moxifur- Eye Drops is a sterile topical ophthalmic solution. Moxifloxacin is a fourthgeneration fluoroquinolone antibacterial agent active against a broad spectrum of Grampositive and Gram-negative ocular pathogens, atypical microorganisms and anaerobes. Moxifur- Eye Drops is a clear, greenish-yellow solution formulated as a sterile, multipledose product, for topical ophthalmic use. Moxifloxacin is fluroquinolone derivative interfere with DNA synthesis during bacterial replication by inhibiting DNA gyrase activity. Bacterial gyrase, unlike the comparable human enzyme,is susceptible to inhibition by the fluroquinolone,and this inhibition kills the bacterial. It is active against citrobactar,Enterobacter,E-coli,Neeisseria gonorrhea,Proteus mirables,S.aureus,s.epidermis, S-pneumoniae,P.aeruginosa,H.influenzae and most other gram-negative bacteria. Moxifur- Eye Drops is indicated for the treatment of bacterial conjunctivitis caused by susceptible microorganisms. Moxifur- Eye Drops are contraindicated in patients with a history of hypersensitivity to moxifloxacin, to other quinolones, to any of the excipients in this medication. NOT FOR INJECTION. Moxifur- Eye Drops should not be injected subconjunctivally, nor should it be introduced directly into the anterior chamber of the eye. Instil one drop in the affected eye(s) 3 times a day for 4 days. To prevent contamination of the dropper tip and solution, care should be taken not to touch the eyelids, surrounding areas, or other surfaces with the dropper tip of the bottle. 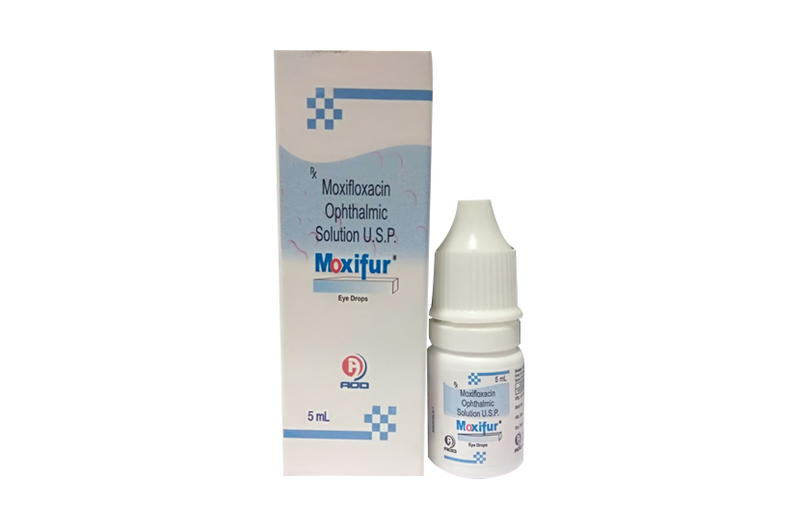 Moxifur- Eye Drops is supplied in one White polethylene Bottle packed with printed labelled & cartons And Such 25 Carton Packed in a Shrink Sleeves & corrugated box.